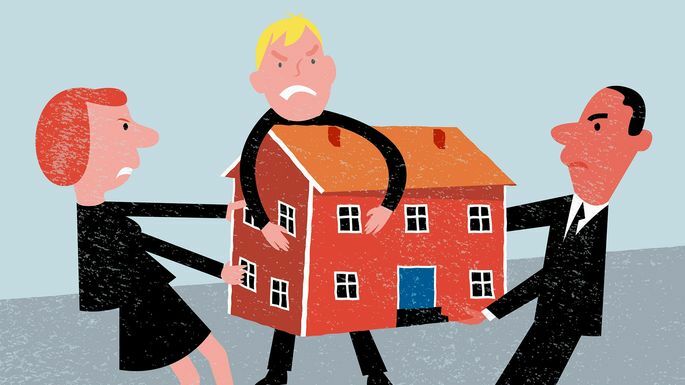 Here’s how to navigate selling a house with your siblings without drama—or wrestling each other to the floor like you did when you were kids. Michael Mazek, an attorney in Chicago, says the most common problem when it comes to an estate is that there’s usually one sibling who doesn’t want to sell. This sibling may prefer to have the property remain in the family or rented out. “The challenge is that essentially puts all the siblings into a business partnership,” says Mazek. And things can quickly go south. If siblings agree to keep the home, what usually happens is that the workload isn’t even—maybe one sibling lives in a different state than the home—and soon brothers and sisters find themselves battling over money or time spent looking after the house. “That’s why it’s usually best to sell the property and use those funds to purchase individual investments or simply keep the profits,” says Mazek. If one sibling wants to keep the home, he or she can buy the others out for their share of the home’s fair market value. However, if a buyout isn’t an option, even just one sibling generally has the right to force a sale even if the majority are against it. The process is called “partition by sale,” and the net proceeds are divided among the owners. “Generally the property will be sold at a sheriff’s sale, which is a court-ordered sale most frequently used in foreclosure auctions,” says attorney Richard Winblad of WinbladLaw.com, in Edmond, OK. The minimum winning bid must usually equal at least two-thirds of a home’s value. For instance, a property worth $200,000 can sell for $133,333. Selling a property as is means skipping upgrades and settling for a lower asking price. It can make sense to sell the home as is if the siblings live far away and can’t oversee home improvements prior to the sale. “When only a top-to-bottom renovation makes sense, as is is the better option,” says Ailion. Major renovations take time, money, and patience, for which some or all of the siblings may have limited capacity. The sentiment surrounding a family home may cloud any given sibling’s idea of how much the home is actually worth. The solution? Have the home’s value appraised to avoid a family “debacle,” says Paige Arnof-Fenn, founder and CEO of marketing consulting firm Mavens & Moguls. Granted, the real estate agent you’re working with can also suggest a number based on comparables. But an objective appraiser, who works for neither buyers nor sellers, will come up with the actual value of the home in a bank’s eyes, all for around $300 to $400. It could be worth the expense. “When my mom died, she left me and my two siblings a condo in Florida that no one wanted,” says Arnof-Fenn, who, as the eldest, became the point person. She advises overly communicating with the family to avoid conflict or misunderstandings. As always, in any real estate situation– call on your trusted professionals at Greenbrier Real Estate Service.